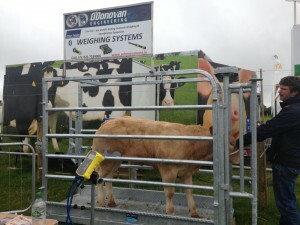 All the team here at O’ Donovan Engineering had a great time at Tullamore Show this weekend. The weather was beautiful and there was a huge turnout with over 70,000 people reported to have attended the show this year. It was an early start Sunday morning for some of the team to facilitate the weighing for all the commercial weight classes. We were delighted to be asked to sponsor the weighing again this year, it gave us a great opportunity to meet some wonderful farmers and their extraordinary cattle. We would like to thank everyone who visited our stand to enquire about our products and made the day as enjoyable as it was. Unfortunately as we were extremely busy we may not have had a chance to speak to everyone that visited our stand on the day and we apologise for that. If you did not get a chance to speak to any sales personnel please contact us on 021 7334066 for any queries you may have, we would be delighted to speak to you. We would also like to thank all the organisers of the show for putting so much work into the day to make it pleasurable and successful for everyone. We are looking forward to next year already.